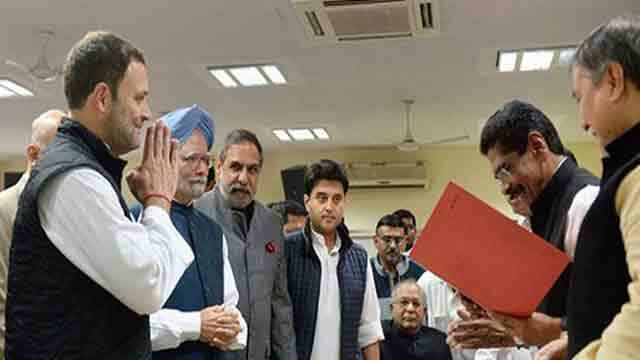 New Delhi, Dec 4 (Just News): Congress Vice President Rahul Gandhi filed his nomination to take over as the next Congress President at the party headquarters in Delhi today. Top leaders of the Congress party were present as over 90 sets of nomination papers were filed to support Rahul Gandhi's candidature. Once elected, he will take over as Congress President from his mother and current party chief Sonia Gandhi. Six Chief Ministers -- Punjab's Amarinder Singh, Karnataka's Siddaramaiah, Himachal Pradesh's Virbhadra Singh, Puducherry's V.
Narayanasamy, Meghalaya's Mukul Sangma and Mizoram's Lal Thanhawla -- were present when over 90 sets of nomination papers were filed by various leaders to extend support to Rahul Gandhi's candidature. Congress state unit chiefs, senior leaders and Pradesh Congress Committee delegates were present at the party's central office to express support to Rahul Gandhi ahead of his much-awaited elevation. Rahul Gandhi reached the party headquarters around 10:45 am to file his nomination. He then signed sets of nomination papers before the Returning Officer. Apart from leaders of states and union territories, senior leaders on the Congress Working Committee or CWC, including former Prime Minister Manmohan Singh, AK Antony, Ahmed Patel and Ghulam Nabi Azad submitted different sets of nomination papers. With Rahul Gandhi in all likelihood to be the only candidate in the fray, he could be declared the next Congress chief on tomorrow after scrutiny of nominations. He will succeed his mother Sonia Gandhi, the longest serving Congress chief who has steered the party since 1998. Rahul Gandhi became the Congress Vice President in January 2013.